Sun City Anthem in Henderson, Nevada is a beautiful Del Webb active adult community perched in the foothills of the Black Mountains 800 feet above the valley floor. This ideal elevated location offers magnificent views of Las Vegas Strip, cooler temperatures and cleaner air than surrounding locations in the Las Vegas area. The community includes three clubhouses, two 18-hole golf courses and over 50 clubs and interest groups. Sun City Anthem in Henderson is home to 7,144 households, making it one of the largest active adult communities in the Las Vegas area. Construction began in 1998 and was completed in 2008. Many buyers favor the community for its beautiful homes, world-class amenities and ideal location. Current homebuyers can select from a wide range of pre-owned resale homes available at reasonable prices. A wide assortment of amenities are uniquely tailored around the preferences of active adults. The community includes three clubhouses that host over 130,000 square feet of indoor amenities. The Anthem Center is the 77,000 square-foot main clubhouse that offers luxurious furnishings and panoramic vistas of the valley below. It contains an indoor lap pool, an indoor walking track, craft rooms, hobby studios, a computer lab, grand ballroom and several multi-purpose and meeting rooms. This active adult community also has a state-of-the-art fitness center with high-end cardiovascular and weight-training equipment along with an aerobics and dance studio. The Serenity at Anthem Day Spa pampers residents with full-service spa treatments. Outdoors, residents can enjoy the beautiful pool and patio with gorgeous views of the surrounding mountains. There are also several bocce ball, pickleball, and tennis courts, as well as horseshoe pits for gathering with neighbors. A walking and biking trail is also accessible for residents who want to take a leisurely stroll along the meticulously-landscaped grounds. The second clubhouse is Independence Center, a 31,000 square-foot facility that hosts the 300-seat Freedom Hall. The Center includes three multi-purpose rooms along with a billiards room, arts and crafts studio, woodworking shop and library. An additional fitness facility at Independence Center includes a 2,000 square-foot workout room with an aerobics studio. An outdoor courtyard provides a great meeting place for various community events. The 20,000 square-foot Liberty Center has additional indoor and outdoor swimming pools. There are tennis courts, including a championship court with stadium seating, and pickleball courts. The facility also has bocce ball courts, pickleball courts and multi-purpose rooms. Del Webb's Sun City Anthem in Henderson is home to one of the premier golf clubs in the Las Vegas area, The Revere Golf Club. It presents a blend of beauty and challenge unlike any in southern Nevada. Draped through rugged desert canyons and valleys of the foothills, The Revere Golf Club offers awe-inspiring views of the Las Vegas Strip and surrounding mountain ranges. This Troon Golf managed course was designed by hall-of-famer Billy Casper and renowned golf course architect Greg Nash. The club includes practice facilities and a 23,000 square-foot clubhouse with a fully stocked pro shop and full-service restaurant, Buckman's Grille. It is the ideal place to gather with friends for a refreshing drink after a round of golf or an intimate retreat with your significant other for a romantic dinner. This 55+ community offers a wide variety of real estate options from intimate villas at reasonable prices to spacious single-family homes appointed with luxurious finishes. This active adult community was constructed between 1998 and 2008 by Del Webb. All of the new construction homes have been sold by the developer but a continually changing assortment of pre-owned resale homes are available for sale. Throughout the ten-year construction, Del Webb offered 31 different single-family and two villa floor plans. All homes in Sun City Anthem offer a covered front entrance and rear covered patio. Some of the larger homes are available with casitas and front courtyards. These plans offer residents one to four bedrooms, one-and-a-half to three-and-a-half bathrooms, and include two-car garages with some homes providing optional golf cart garages or a three-car garage. All homes built between 2003 and 2008 come standard with a hot water recirculating pump, which provides instant hot water and conserves on water usage. Included features vary by model from very basic finishes to highly upgraded units with gourmet kitchens, tile or wood flooring, spa-like bathrooms and custom moldings. Many homes in this community enjoy sweeping views of the Las Vegas Strip or overlook one of the golf courses. Life in this active adult community is filled with a never-ending array of fun activities, club meetings, classes and fun events. There are over 50 different clubs and interest groups that include everything from sports and fitness to arts and crafts. Residents can choose to diversify their exercise routine by joining a spin class, water aerobics, or a Zumba class. Special interest groups range from political clubs to a book club to the pet lovers group. This community also makes it easy to meet new neighbors with regular happy hours, potlucks, and meet and greet events. With a large, well established community, residents will have no problem finding a group or club that's just right for them. The Sun City Anthem activities director is continually offering the residents a smorgasbord of activities that include aerobics and yoga classes, neighborhood barbecues and continuing education classes. For residents who prefer to venture out, there are many group excursions to the Las Vegas Strip and even cruises to exotic destinations. Whatever your interests, you will surely find other like-minded residents who share your passion for living life to the fullest. Sun City Anthem in Henderson, NV sits at the southern edge of the Las Vegas Valley. Two regional shopping malls are within 12 miles of Sun City Anthem. Lake Mead and its hundreds of miles of shoreline are just 30 minutes to the east. The Las Vegas Strip offers countless opportunities for gambling, shopping, dining and catching great shows. Most destinations in the valley are accessible in less than an hour and McCarran International Airport is just 15 minutes down the road. Active adults in Henderson, Nevada will enjoy all that this community has to offer between its beautiful homes, bountiful amenities, and convenient location. The Anthem Center clubhouse is the largest of the three at Sun City Anthem and is the main center for social and recreational activities. It also hosts the Serenity at Anthem Day Spa. Anthem Center Clubhouse - 77,000 Sq. Ft. The Independence Center is where several activities are held, including performances at the 300-seat theater. Independence Center - 31,000 Sq. Ft. The Liberty Center is the newest of the amenity centers and provides a more tight-knit experience with your neighbors. Liberty Center - 22,000 Sq. Ft.
Sun City Anthem residents enjoy discounted rates at the Revere Golf Club, two 18-hole courses designed by Billy Casper and Greg Nash. There are plenty of activities available in Sun City Anthem. Here is a sample of some of the clubs, activities and classes offered here. The Cottages are small single-family homes built between 2001 and 2002. These intimate homes are ideal for the homebuyer who needs minimal space and a minimal price tag. The two home choices range from 1,080 to 1,160 square feet. The Classic series homes were built by Del Webb between 1999 and 2004. All homes include one bedroom and two bathrooms plus a den that can be converted into a second bedroom. The Garden Villas are attached duplex homes. Buyers can select from two models that include the 1,392 square-foot Madison or 1,444 square-foot Franklin. These homes were built between 1999 and 2000. Homeowners enjoy exterior building maintenance provided by the association. The Casuals were constructed by Del Webb between 2002 and 2003. The two single-family home models offer secluded kitchens and spacious living rooms or great rooms for entertaining. The Colonials were built by Del Webb between 2004 and 2007. These popular floor plans showcase open kitchens overlooking spacious great rooms. Most plans include two bedrooms plus a den. The Premiers were built by Del Webb between 1999 and 2003. These spacious homes are ideal for homebuyers who want more room and adequate space for guests. Most plans offer optional casitas and two to four bedrooms. The Capitals were introduced by Pulte/Del Webb in 2004. This collection includes five models with options that can range from very basic to homes with highly upgraded fixtures and amazing views. The Estates are Del Webb built homes constructed between 1999 and 2003. These opulent homes offer all the luxuries one would expect in an estate home at Sun City Anthem. Large great rooms, gracious living rooms and expansive kitchens are common on most of these plans. Other options such as three-car garages, oversized master bedrooms, casitas and magnificent views of the Valley make the Estate collection a popular choice for those who want the finest luxury. The Revolutionary Series homes were built by Del Webb between 2004 and 2007. These new-style estate homes offer open and airy designs ideal for entertaining. Many plans include two to three-car garages along with large great rooms, wet bars and spacious kitchens. Numerous choice homesites enjoy fabulous views of The Strip. The landscaping and buildings have gone downhill. HOA has major financial trouble. I would have never bought here if it looked like it does today. Lots of great amenities for a reasonable price and lots of friendly, helpful people! Great community! So many activities in all the clubhouses. Golf course is beautiful. Close to everything! My husband and I have lived in many states and chose Henderson as a retirement location because of sunshine, good food, good entertainment, good taxes (well, no state income tax anyway) and a good airport. We also wanted to live someplace where friends and family would enjoy visiting (and they have!). Finding Sun City Anthem cinched the deal for us. Living here is like resort living every day. Residents of Sun City can be as busy and involved as they want to be, and can enjoy the quiet solitude if desired. With over 50 clubs, there is something for everyone. There are many opportunities to volunteer, in support of fellow residents or those less advantaged in the community. We are really thrilled we moved here and don't ever plan on leaving. My wife and I looked at a number of Sun City and Trilogy properties. We felt the location of Sun City Anthem was the best for us. They have everything you need or want. 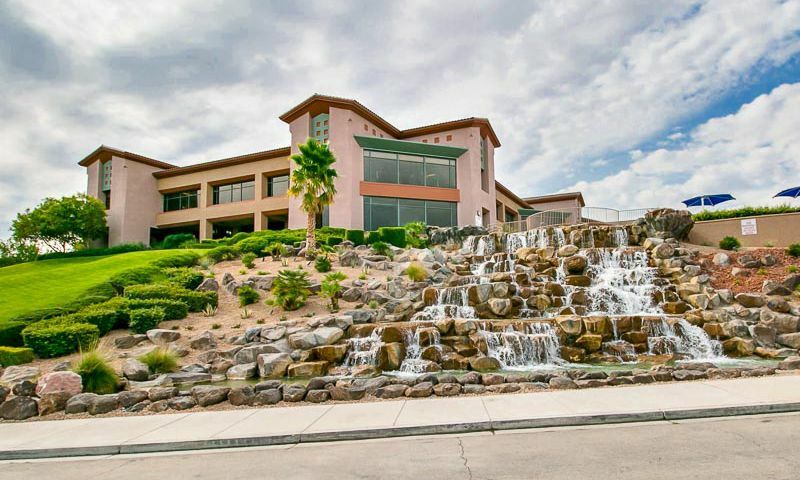 You are 15 minutes away from the Las Vegas airport where you can fly to just about anywhere in the country, beautiful golf course and city views, spacious and modern facilities, clubs for all activities, Las Vegas entertainment and very friendly neighbors. We could not be happier! I moved here a couple years after my husband passed. The kids really encouraged me to make the move, meet new people and boy did I ever! There is so much to do here and there are so many people to connect with. I've had a goal to try something new every month and with all the different clubs and activities here, it's been easy to do! great facilities and tremendous amount of options available in region as well as on site. Cost of living significantly less than Florida and no hurricanes and need for state (only available) supported wind insurance. 55places.com is not affiliated with the developer(s) or homeowners association of Sun City Anthem. The information you submit is distributed to a 55places.com Partner Agent, who is a licensed real estate agent. The information regarding Sun City Anthem has not been verified or approved by the developer or homeowners association. Please verify all information prior to purchasing. 55places.com is not responsible for any errors regarding the information displayed on this website.